We’ll provide some details and insights on some of the potential top daily fantasy defense/special team value plays for week 3. Dallas Cowboys – Salaries: DraftKings (DK) – 2200, FanDuel (FD) – 3400. Dallas’ salary ranks them 26th on both DK/FD. The betting lines with the Seahawks has the game total at 41.5 points with the Cowboys as +1 point road dogs. The Seahawks’ implied team total is currently at 21.25 points and the Cowboys are currently at 20.25 points. The open line on the game total had dropped a point and the Seahawks opened at -3. Against the Seahawks last week, the Bears’ defense logged 6 sacks, 1 pick returned for a TD, and a fumble recovery. The Bears defense scored 17 fantasy points which ranked them 1st. Thru the first two weeks, the Seahawks have given up the most sacks with 12, have the 2nd most (tied) giveaways with 5, and rank 27th in offensive yards with 291/gm. The Seahawks also allow the 2nd most fantasy points to opposing defenses with 14.5/gm. Last week, the Cowboys ‘ defense tallied 6 sacks, 1 fumble recovery, and held the Giants to 13 points. The Cowboys ranked 4th in fantasy points allowed last week, and rank 5th thru the first two weeks. The Cowboys also rank 2nd in sacks with 9 thru the first two weeks. The Cowboys scored 12 fantasy points to finish as the #4 (tied) defense last week. Is Brian Schottenheimer still employed? Check. Is the O-line still comprised of turnstiles? Check. Is the running unit still within the bottom-five? Check. Is Doug Baldwin still out? Check. The under-priced Dallas unit provides a nice value with multiple paths to score points this week. Cleveland Browns – Salaries: DraftKings (DK) – 3000, FanDuel (FD) – 3500. The Browns ‘ salary ranks them 5th/24th on DK/FD, respectively, making them a much better relative value on FD. The betting lines with the Jets has the game total at 39.5 points (lowest on the board) with the Browns as -3 point home favorites. The Jets’ implied team total is currently at 18.25 points and the Browns are currently at 23.5 points on Thursday night. Against the Jets last week, the Dolphins’ defense logged 3 sacks, 2 picks, a fumble recovery, and held the Jets to 12 points to finish as the #2 (tied) defense with 13 fantasy points. The Jets offense gives up the 3rd (tied) most turnovers with 5. The Jets also allow the 6th most fantasy points to opposing defenses with 12/gm. The Browns’ defense recorded 3 sacks, 2 fumble recoveries, and allowed 21 points at New Orleans last week. The Browns finished as the 10th (tied) ranked defense with 7 fantasy points. The Browns defense ranks 1st in takeaways with 8 and 3rd in sacks with 10. Thru the first two weeks, the Browns’ defense is averaging 11.5 fantasy points per game ranking them 5th. And this was against Pittsburgh and New Orleans. As a home favorite with the lowest game total, the Browns’ defense will probably make for a popular play on any slate involving Thursday night. 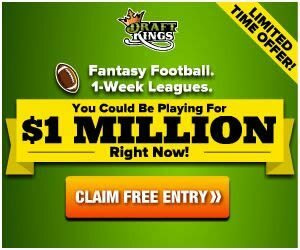 Cincinnati Bengals – Salaries: DraftKings (DK) – 2500, FanDuel (FD) – 4200. The Bengals’ salary ranks them 15th/10th on DK/FD, respectively. The betting lines with the Panthers has the game total at 43.5 points with the Bengals as +3 point road dogs. The Panthers’ implied team total is currently at 23.25 points and the Bengals are currently at 20.25 points. Against the Panthers last week, the Falcons’ defense recorded 2 sacks and one interception. The Bengals ‘ defense logged 4 sacks, 2 picks, and one fumble recovery against Baltimore. The Bengals also landed 17 QB hits, tied for 3rd last week. The Bengals 12 fantasy points ranked them as the #4 (tied) defense last week. The Bengals rank 4th (tied) in takeaways with 5 and 8th (tied) in sacks with 6. Thru the first two weeks, the Bengals are averaging 11 fantasy points per game, ranking them 6th. The Bengals are a legit defense play this week at their price tag.